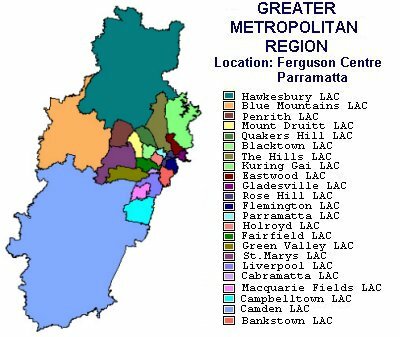 Greater Metropolitan Region is based at the Ferguson Centre, Parramatta. It will extend from Hawkesbury and Kuring-gai in the north, to the Blue Mountains in the west, from Camden in the south to Bankstown, Flemington and Gladesville in the east. Listed below are the 23 Local Area Commands (LAC), that are in the Greater Metropolitan Region. On the ‘left’ of each LAC is a link to every police station within that Local Area Command.